To combat corruption might create not only political but also very tangible capital.. For example, the manufacturer of 'A Sweet Piece of the Budget' chocolate bars saw its sales increase three-fold in just two weeks after making the right bet. The latest survey by GlobeScan, a Canadian public-opinion and research company, shows 67% of Russians consider corruption to be the country’s most serious problem today. Andrei Sharkov, the owner of Chocobox, an online chocolate store, capitalised on this sentiment in developing his marketing strategy. In April, he designed and put in an order to have boxes of his A Sweet Piece of the Budget chocolates producted. 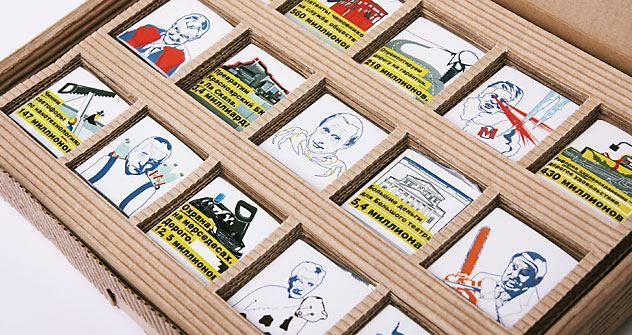 The box contains 30 bars with wrappers featuring government officials and logos of state-owned companies that have been exposed as corrupt, complete with a background explanation. Sharkov borrowed the characters for his chocolates from the popular blogger Alexei Navalny, who also provided a strong online PR campaign (see the chart below). Chocobox was careful to change the logo colours. “This should protect the company from liability for using registered trade marks and harming business reputations”, believes Igor Trunov, a lawyer with Trunov, Aivar and Partners. Sharkov is launching a new set of chocolates in June, this time based on graft with the traffic police. Chocobox is not alone in having harnessed this popular trend. In September 2010, souvenir manufacturer Evrika started making two desktop signs with We Don’t Take Bribes and I Won’t Give You Money written on them. The reverse side of both signs says $100 is Not a Bribe. The anti-corruption signs sell 20% better than the others in Evrika’s extensive line. The jewellery store Vzyatka (Bribe) in Bryansk is also doing well. The owner, Tatyana Kruzhalina, came up with the name six years ago, when officials hired by her competitors started harassing her business. The store, together with its quirky sign, has become a local attraction; tourists buy jewellery there too. A box of chocolates called Not a Bribe, however, introduced by Konfael at the beginning of 2009 did not take with consumers, and for good reason. Two years ago GlobeScan found that only 23% of Russians thought corruption was a serious problem: only now, one year away from Russia’s presidential elections in 2012, has corruption become a significant issue. The trend may still prove to be short-lived.